Youth services are provided to 17-24 year old in-school and out of school Baltimore area youth. 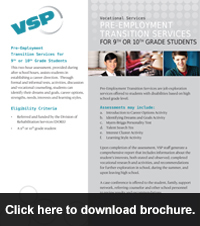 High school students receive career exploration and planning guidance, paid internships, and support during high school and as they transition from school into post-secondary education or employment settings. Older youth with interest in health care employment receive job readiness training, a LifeBridge Health-based paid internship, often leading to employment or further education. Offered to Baltimore area high school students with disabilities based on school grade level, PreETS includes career exploration, interest and learning style testing, self-advocacy training and job search skills analysis. Students learn self-advocacy skills, disability awareness, and strategies to identify and communicate accommodation needs. As a result, students determine a career direction with short and long-term vocational objectives and are prepared and supported to enter paid internships, such as Work-Based Learning or Win through Work. Work-based Learning and Win through Work offer Baltimore area high school students with disabilities, ages 16 and older, a paid internship at LifeBridge Health. Work-based Learning students participate in job readiness training within a LifeBridge Health department, while fostering career exploration through assessment of vocational strengths, weaknesses and skills. Through individual plan development, issues of self-esteem, work behaviors, and interpersonal relationships are addressed, while students acquire job-related skills. Win through Work services are provided to students in their exiting high school year and include all above-mentioned services. 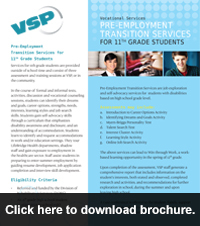 Students are supported as they transition from high school into post-secondary settings or local employment through VSP job placement services. Click here to view the Win through Work brochure. Job placement services can be provided for a fee to Win through Work program graduates. HVSP’s Healthcare Careers Alliance (HCA) is a Baltimore City Mayor’s Office of Employment Development-funded program that provides workforce development services to low-income, out-of-school youth ages 18-24 residing in Baltimore City and who possess a GED or high school diploma and an interest in entering the healthcare field. HCA is a funded collaboration between Sinai Hospital/VSP and Civic Works, Inc. Services include career assessment, job readiness, life skills training, paid internship and work training, transitioning into permanent employment at LifeBridge Health or other local healthcare institutions, or entrance into post-secondary training. Youth are supported for 12-months post-placement to ensure job retention and promote career ladder advancement. Click here to view the Healthcare Careers Alliance Services brochure.